Students Leaving their Marx ... in Val? 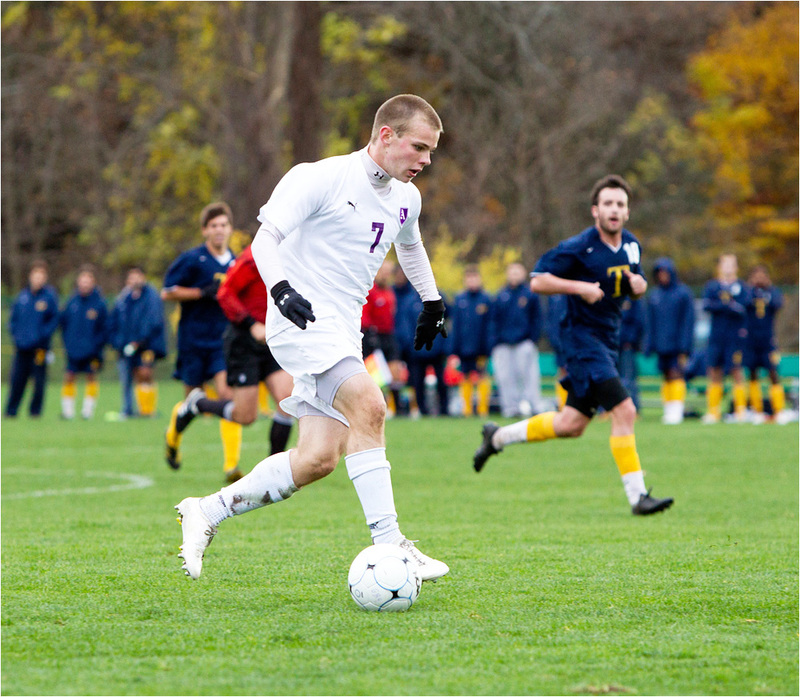 Wing midfielder Casey McNamara ’13 scored Amherst’s second goal in Saturday’s 3-0 win over Colby-Sawyer. With a wide array of skilled, talented playmakers, the Jeffs should boast one of the most prolific offenses in the NESCAC. After an intense, rigorous and sweat-drenched preseason, the men’s soccer team justified its national No. 19 ranking with a pair of non-league wins over the weekend. On Saturday, the Jeffs handily defeated Colby-Sawyer College 3-0 to open the season on a victorious note. The team then continued its winning ways Sunday with a 2-1 double-overtime victory over Bridgewater State University. Led by the dynamic play of forward Jae Heo ’14, the Jeffs dominated Colby-Sawyer in a game that wasn’t nearly as close the score indicated. The team held decisive advantages in corners (7-1) and shots (24-6). “The first game of the season is always an electric atmosphere. That energy can manifest itself in a number of ways, but we were able to harness it effectively and put in a strong performance against a formidable Colby-Sawyer squad. The score line often fails to reflect the nature of the game and that was certainly the case here,” said co-captain and defender Sam Kaplan ’12. Against Colby-Sawyer, Heo opened the scoring with a brilliant top-corner finish in the 34th minute. The Jeffs quickly capitalized on the momentum, as Casey McNamara scored just four minutes later to extend the lead to 2-0. Brian Morgan ’13, making his collegiate debut, added an insurance goal in the 73rd minute to seal the result. On Sunday, the team had more trouble handling Bridgewater State, as the Jeffs needed double overtime before emerging victorious. Ben Norton ’14 netted the game winner in the 108th minute, with just 2:48 remaining in the overtime session. The Jeffs again thoroughly bested their opponents in corner kicks (16-5) and shots (26-11). The Bears’ goalkeeper, Joe Parsons ’14 played a noteworthy game between the posts to keep his team in it. “The game was definitely close but their goalkeeper also made some good saves which had he not, maybe the game could have ended in regular time. They were always threatening though but ultimately I think a 2-1 win in our favor is a fair reflection on the game,” Tsatsimpe said. Alejandro Sucre ’13 played a memorable game, opening the scoring with a clinical finish from Tsatsimpe’s cross in the 49th minute. He threatened several other times late in the game and during the extra sessions, but stellar goalkeeping kept his tally at one. The Bears equalized the contest on a set piece in the 60th minute. The Jeffs, however, would get the last laugh in overtime. After the Jeffs earned a free kick in the 108th minute, Kaplan’s ball was flicked on by an airborne Alejandro Sucre; the ball deflected toward Norton, who slotted a shot into the back of the net. In general, the team was happy but not overjoyed with their weekend performance. “Anytime you get a quality win against a good New England team like Bridgewater State, you have to be happy. However, we still have a long way to go in many phases of our play. I was satisfied with our effort, just not overly satisfied about our execution. It’s hard to win soccer games, so we’ll take the win,” Serpone said. The team now turns its attention towards hosting a pair of NESCAC games over the coming weekend. Bates and Middlebury travel to Hitchcock Field Saturday and Sunday, respectively, in what promises to be a pair of entertaining clashes. The Jeffs routed Bates on the road last year, winning 5-0 in what was arguably the team’s most impressive performance in the 2010 season. On the other hand, Amherst will be looking to exact revenge against Middlebury; the Jeffs compiled a 13-2-4 record last season, but both of their regulation losses came against the Panthers, including a disheartening 2-0 setback in the NESCAC semifinals. The Amherst-Middlebury rivalry has intensified in the past few years; in 2008, the Jeffs beat Middlebury in the NESCAC championship game, but in 2009 the Panthers knocked Amherst out in the NESCAC quarterfinals. “We are excited for these games and we hope that our fans are out in full force to help us out this coming weekend,” Kaplan said.